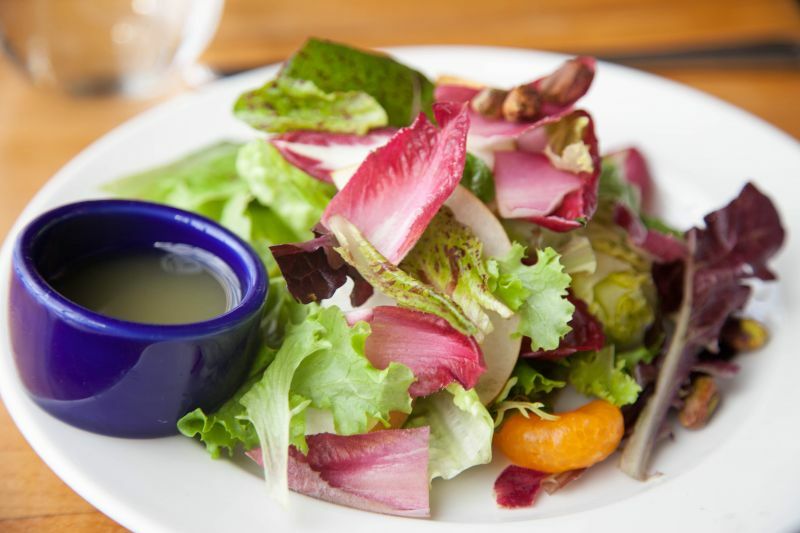 On my way to attend the San Francisco Chronicle Wine Awards, I dined at Greens Restaurant for lunch with a friend. 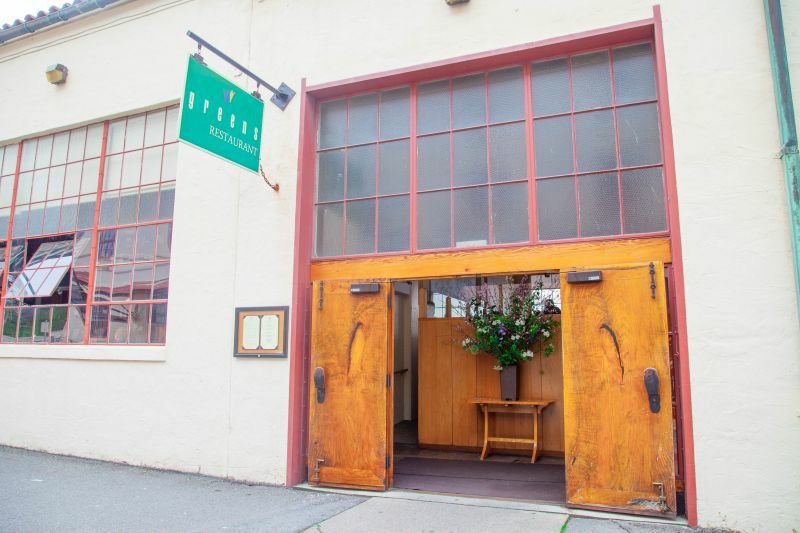 It is one of the few places located right inside the Fort Mason Center where the event was being held, so it seemed like a good choice. My friend chose the restaurant (she’s also a big foodie as well as amazing wine blogger) so I didn’t know anything about it other than it being a vegetarian place before we went. I didn’t even look at the menu beforehand. I always like it when I am in for new food experiences, and it was part of the fun to be surprised in this case. 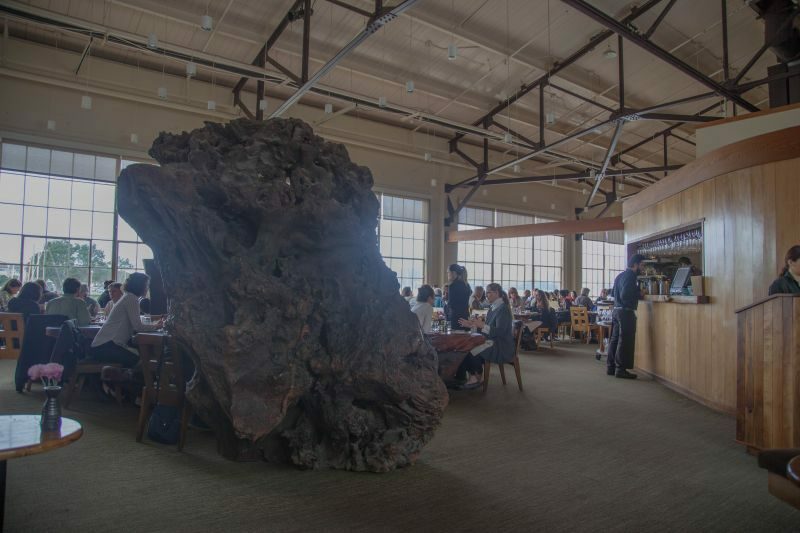 The inside of the restaurant is an open bright space with a bar on one side of the room and a very interesting huge natural driftwood sculpture dominating the middle of the dining area. 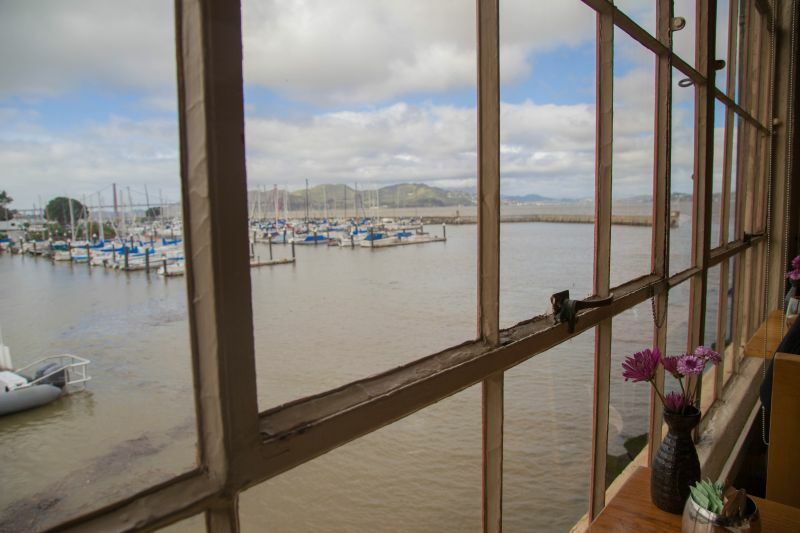 There are large floor to ceiling windows that overlook the bay and the famous Golden Gate Bridge. It was a beautiful day and we had an amazing view over lunch. Knowing I was going to be drinking a lot of alcohol, I wanted to make sure that I had something substantial for lunch. I ordered the Pinnacles Scramble. 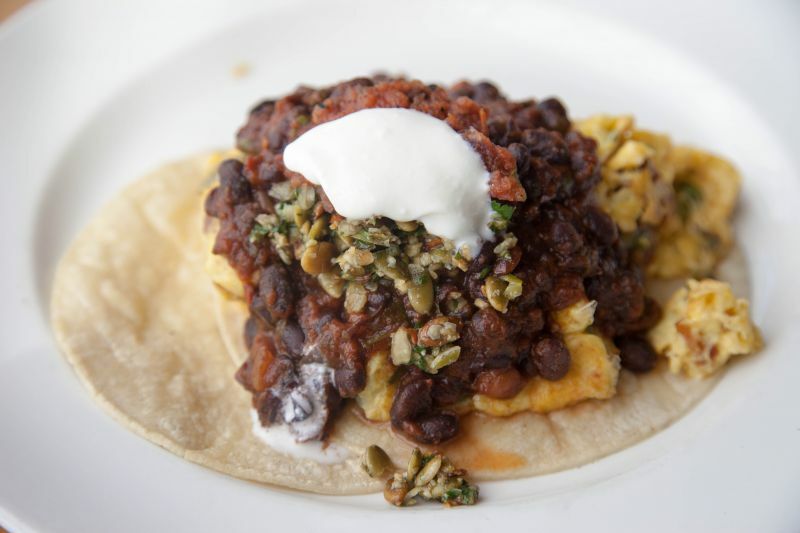 The dish included scrambled eggs, potatoes, poblano, and chipotle chiles, scallions, cheddar cheese and cilantro. The aforementioned ingredients were served on top of corn tortillas. It was also accented with pumpkin seeds and black beans. The combination was neither outstanding nor unpleasant. It was just “good enough” and I ate my food without complaint. I think it was just lacking flavor or any WOW factor. The whole thing tasted middle of the road in every way. My guest ordered a simple salad with her dressing on the side. It supposedly consisted of star route lettuce, little gems, and red endive. The menu said it had Asian Pears, satsumas and pistachios on it. It looked nice and fresh, though there was maybe one little sliver of pear and orange that I could see on the plate. It was truly unremarkable in any way and it looked less good than something you’d get at a Cheesecake Factory. She seemed to enjoy her food well enough, but I didn’t really see much joy to her eating. 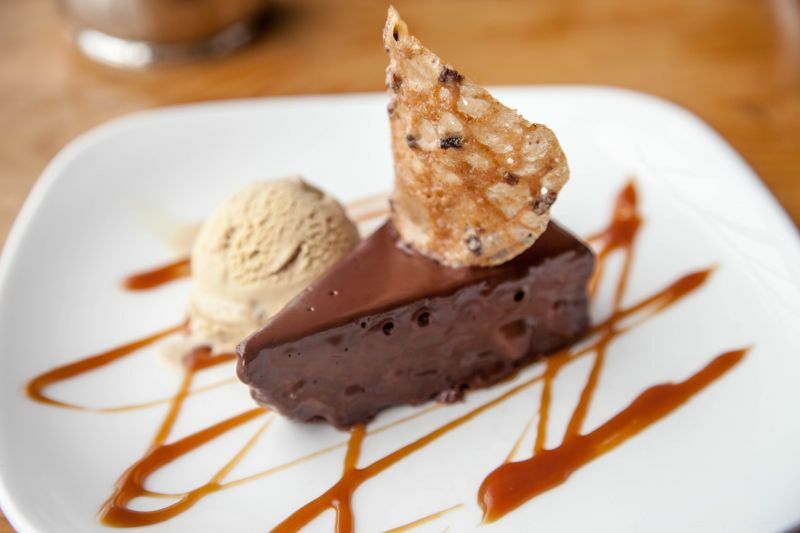 We ordered a dessert to share and decided on the flourless chocolate cake. Unfortunately, this dessert really underwhelmed both of us and we ended up having only one bite each. In fact, I thought the cake to be both bland and dense. The caramel sauce didn’t do much to help it either. The one real joy was the coffee ice cream that came with it. That was really good quality with tons of intense coffee flavor and creaminess. As we were going to a wine event, neither one of us ordered any wine. Our drinks were one coffee and one iced tea. Our server was really pleasant, efficient, and kept our drinks filled. I thought they did a good job of service throughout our lunch. The total for our meal was a little over $50.00. For what we ate I thought it was really expensive but you have to consider that we were in San Francisco in a trendy restaurant. While writing this review I looked at their website and noticed that they are Michelin Guide recommended. I have to say that I was surprised learning that as I was less than impressed with our meals. I can’t really recommend Greens unless you are looking specifically for vegetarian food and a view of the Golden Gate Bridge. The food was just a meh, but the service and the setting were great. I love those doors! That driftwood is amazing!